Australia is a series loser once again, but it may not need to go all the way back to the drawing board on this occasion. AUSTRALIA has lost yet another series, but it may not need to go all the way back to the drawing board this time. The three-match ODI series against South Africa may have started with yet another batting shambles, but it ended with a spirited chase as the side continued to trend in the right direction. Here, foxsports.com.au takes a look at the burning questions to arise from the series. 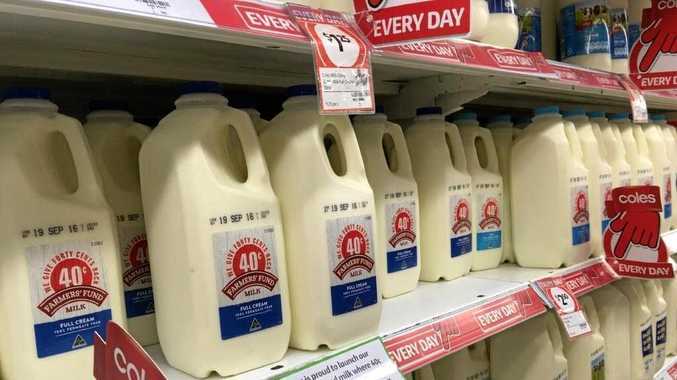 IS THIS ENOUGH TO SPARK THE AUSSIES? To suggest Australia will return to winning ways from here may be overly positive considering its batting problems are, at this stage, deeply embedded. Australia failed with the bat in the first two matches, falling short of 250 both times. The hosts made 153 in the first match. 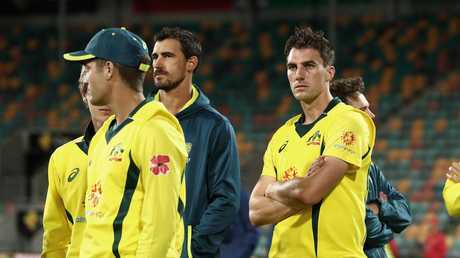 In the second match, Australia made 231 and failed to bat out its allotted overs for the seventh time in its past eight ODIs. Even the players appeared to realise its problems were far from solved, cutting restrained figures in changerooms after registering its only win for the series. "We saw a lot of passion there, we saw them talk about 'what a relief'. But it was a pretty subdued changeroom wasn't it," Adam Gilchrist said after the second match on Fox Cricket. "They realise it's far from a big job done. It's just a small step in the right direction." Shane Warne agreed, saying: "Yeah, relief. They'll be tired, they'll be asleep pretty soon I reckon, there won't be any big celebrations. "Both sides have got plenty of work to do with their batting. As much as Australia got over the line today, it was from some brilliant captaincy, some brilliant bowling, some brilliant energy and intensity in the field." 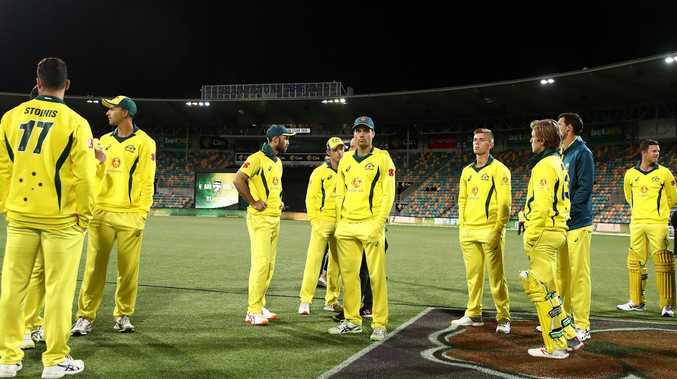 Warne was critical of Australia's shot selections and said that one of its batsmen need to stand up and make a century for Australia to win the series. A player did stand up in the third match to make that century; Shaun Marsh. Although, it wasn't to be a series-winning century. Australia lost the final match by 40 runs, and the series 2-1. The side started its chase on Sunday by losing 3-39 which made an already difficult chase even harder. A positive for Australia, though, is that it finally batted out its overs to make it to 9-280. Furthermore, Australia's batting improved with each match, which could be a good omen for the summer. IS AUSTRALIA'S STAR PACE TRIO UNDERDONE? The figures would suggest so. Mitchell Starc, Josh Hazlewood and Pat Cummins played in all three matches after each having lengthy lay-offs from international cricket since the South African tour in March. Cummins and Hazlewood hadn't played for Australia since that tour, and Starc only played in the two-Test series against Pakistan last month, albeit at a reduced capacity. In the ODI series against the Proteas, the trio took eight wickets at 50.38. Starc was the best of the trio with four wickets at 38.75, although he was the most expensive (economy 5.53). Hazlewood took 3 wickets at 45.33 (economy 4.85) and Cummins figures of 1-112 (economy 4.30). A further indictment on the bowlers is that there was plenty on offer for the fast bowlers this series, particularly at Perth Stadium. South Africa's Dale Steyn, Kagiso Rabada and Lungi Ngidi certainly made the most of them. As a trio, they took 18 wickets at 20.40. Bowling at the death was also a major problem for the Australians. In the last ten overs of the third ODI, South Africa scored a staggering 130 runs. Australia scored exactly half that - 65. The figures would suggest Australia’s pace trio is underdone. HAS FINCH'S CAPTAINCY CALL BEEN JUSTIFIED? Aaron Finch's life as ODI captain certainly started on shaky ground. He notched up his fifth-consecutive single-figure score, his side crumbled to be all out for 152, and Australia lost. He also came under scrutiny for failing to review his own LBW decision which he felt wasn't out (it wasn't), and for not opening the bowling with Mitchell Starc. He picked Nathan Coulter-Nile who went for 16 runs in the first over. Fast-forward six days and Finch was lauded for his tactics in the second ODI win, and even received a man-of-the-match award in part for his captaincy. Finch maintained aggressive field settings and kept the faith in his bowlers, resisting the urge to consistently chop and change. Warne was impressed, saying: "If I'm going to lose it I may as well lose it in the 35th over and not the 45th, I'm going to take an aggressive approach and put pressure on the opposition. "I thought the way he stood up - and I think that inspired the rest of his bowlers. That gave them confidence to come out and bowl the way they did. He backed them. "Even (Adam) Zampa knew he still had the backing and that means a lot. His leadership and tactics today were - take a bow, well done." In the final ODI, Finch put South Africa in to bat first and the visitors made 320 runs. CAN AUSTRALIA CHALLENGE AT THE WORLD CUP? Yes. The obvious reason is the eligibility of Steve Smith and David Warner for the tournament, not to mention Australia's historical dominance. There are less than seven months to go until the World Cup in May and no batsman has done enough to suggest that either star player will be locked out of the side. There is enough, however, to suggest they will be capably supported. Shaun Marsh has now scored three centuries in his last six ODIs and, despite turning 36 next year, is firming for a spot in the team. His last ODI series in the UK - where the World Cup will be held - saw him register 288 runs at 57.60 and two centuries. Further down the order, Chris Lynn and Alex Carey were effectively in World Cup trials in the series against South Africa and proved their worth. Carey took over the gloves from Tim Paine and justified the call by making scores of 33, 47 and 42 from the middle-order. He also faced 184 balls - the second-most of any batsman for the entire series. His consistency and staying power was something the middle-order desperately needed in light of recent collapses. Lynn may have not had the best series, but in the second ODI he showed why he can be the most dangerous batsman in white-ball cricket. He blasted one of the world's best bowlers, Kagiso Rabada, for four consecutive boundaries on his way to 44 off as many balls. But as a team, Australia improved its totals with each game. The belief also visibly grew within the team as it threatened to chase down South Africa's mighty 320 in the final match. Australia may be down, but it's not out.